The grad student pointed out to me by email that I'd overlooked one big advantage of using CsCl gradients to clean up the DNA. He's not analyzing only the fractions that contain DNA, but all the fractions from the gradient. 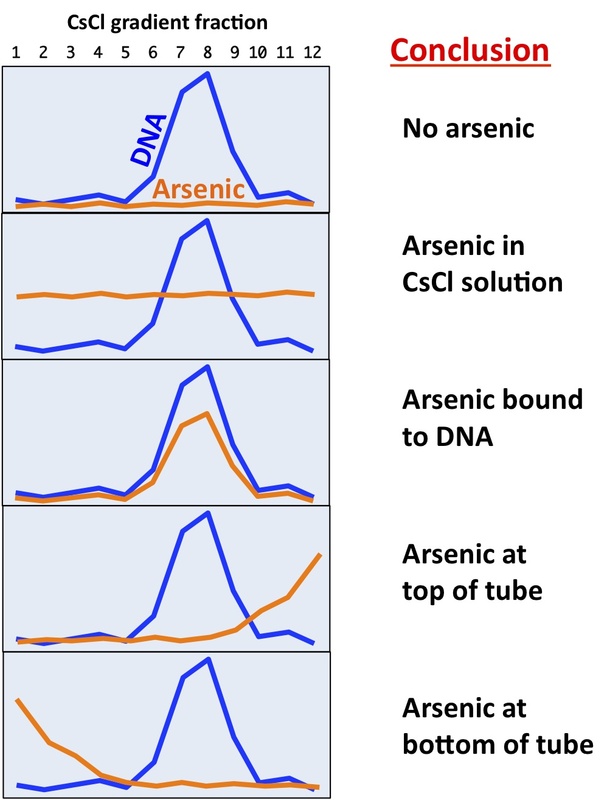 This allows him to detect where in the gradient any arsenic is, and thus lets him distinguish whether the arsenic is bound to the DNA or independent of it. So even a moderate level of arsenic contamination wouldn't be a problem. "Characterizations of intracellular arsenic in a bacterium"
FYI I wouldn't click on the link provided above. It links to a shock site image. Hopefully someone with administrator privileges for the blog can delete it soon. @Anonymous: I'd love to be able to hear FWS's talk at the Origin of Life meeting, but Gordon Conference presentations are not for public consumption so we'll have to wait for a different source. I can't see any 'link provided above', but if you give me more info I can clean it up. This is a different post from the original one --same shock image though. Scroll over the link without clicking on it and you can see that it is actually a link to something other than what it appears to be. Someone with some knowledge of this topic is making an effort to be obnoxious. I wonder if turning off anonymous posting would solve the problem? Can you see the IP address of anonymous posters? Also perhaps disabling the ability to disguise links would help? I'm sure there are ways to circumvent all of those solutions, even if they are possible. Trolls notwithstanding, I'm excited to see what the mass spec comes back with. despite the troll being, well, a troll, he has raised some interesting points. Rosie—I think in the spirit of this internet group meeting, its important to hear what are your thoughts on this matter? 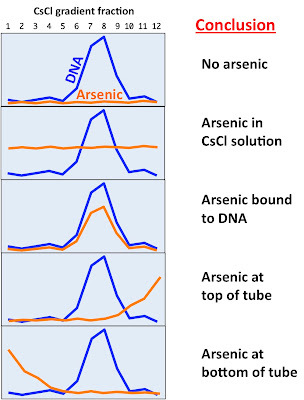 Of course its always challenging to know how to present negative results, but how will we really be convinced that there is no arsenic in the DNA in the end, especially if this DNA has been out of GFAJ1 for almost a month now? I hadn't seen the troll's question because Edward, the wonderful Field of Science admin, has been watching my back and deleted it for me. But he's now sent me a copy, so I'm going to consider the issue it raised in a separate post.